Today we are pleased to welcome Jennifer Petkus, author of Jane, Actually, as she shares her thoughts on darkness and the beyond. Be sure to enter for a chance to win a copy. Ms. Perkus has graciously offered two (2) physical books for US residents with valid US mailing addresses, and four (4) ecopies for giveaway! There are different shades of darkness, I suppose. There’s the deep black that holds eldritch horrors like vampires, witches and zombies and where we find most dark Jane Austen adaptations. Then there’s the dark red of dried blood on the hands of those whose evil comes from within: no supernatural agency need apply. This darkness appeals to mostly men (Lady Macbeth being a notable exception) of power and which I don’t think figures into many Jane Austen adaptations, although an Austen-esque Game of Thrones would be fascinating. Then there’s the existential gray into which anyone can be drawn but which has most appeal to those of a certain age. If you’re a person of any introspection, you’re probably familiar with that dark despair of the soul that awakens you at 3 a.m. and leaves you wondering what you’ve done with your life and how much time is left to achieve a lasting legacy. You might not think this darkness has much to do with Jane Austen, a writer of romantic comedies of manners, but it’s there. Mrs. Bennet feels it when she worries what will happen to her and her daughters after the entailment gives her home to Mr. Collins. Jane Fairfax feels it when she contemplates becoming a governess. Anne Elliot feels it when she’s on the brink of surrendering to spinsterhood. And, of course, Jane Austen must have felt it throughout her life: upon the death of her father, when the romance with Tom Lefroy withered, when she refused Harris Bigg-Wither’s proposal. And with our knowledge of her early death, we feel it when we read that Sense and Sensibility was credited to “By A Lady” and that her name was only revealed upon the posthumous publication of Persuasion and Northanger Abbey. I was worried that my book, Jane, Actually, might not be dark enough for the Dark Jane Austen Book Club. The premise is dark enough: souls do exist and survive corporeal death but until the invention of the AfterNet were unable to communicate with the living or one another and thus most have gone mad. 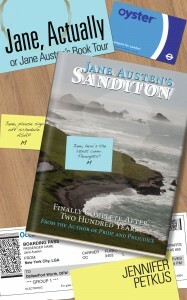 Jane Austen, however, kept her sanity by focusing on Sanditon, the book she’d been writing just before she died. She continued the story, although being a disembodied entity with essentially no substance, all she could do was compose it in her thoughts. For almost two hundred years, she labored on it while watching the world continue without her. For a while, she thought her literary legacy had been forgotten but then she saw successive generations rediscover her. Lately, however, she’s seen her works reinterpreted and she feels her ownership of that legacy slipping away. That’s why she has reclaimed her identity—a difficult task for someone who died so long ago—and has found a publisher for Sanditon. A disembodied soul, however, makes a poor showing on television or the red carpet, so she has hired Mary Crawford, a struggling actor, to represent her at book readings and on talk shows and at the annual general meetings of the Jane Austen societies of the United Kingdom and North America. But not everyone likes the idea of this person who claims to be Jane Austen. A freelance author and an Austen expert seek to discredit her and rob her of her identity, throwing her back into an existential void. Austen knows nothing of this, however. She’s worried about her future as writer: does she keep writing Regency romances or does she try something new for her next book? Should she take a stand against those who write in her name or should she graciously accept what has happened and reinterpret herself? With all these thoughts to plague her and the demands of promoting a book in the age of social media, it’s little wonder she has no time to worry about the other great missed opportunity of her physical existence—love. I don’t know whether this existential gray is dark enough for those who prefer their undead to be a little more active. I think Jane, Actually remains at heart a romance and it’s not dark at all—unless you dwell on the implications of eternity as I have defined it: considering how difficult it is to find lasting love in our short span while alive, can you imagine how difficult it is to find love for eternity? This is the darkness of staring into your own soul and some might think that’s the deepest dark of all. Jane, Actually is Jennifer Petkus’ third book. Previously she wrote Good Cop, Dead Cop (the first book about the AfterNet) and My Particular Friend (a Sherlock Holmes/Jane Austen mashup). Ms Petkus is a member of the Jane Austen Society of North America, Doctor Watson’s Neglected Patients, The Wodehouse Society, and Rocky Mountain Ki Society (she has a first-degree black belt in aikido but refuses to test for second degree because she’s old). 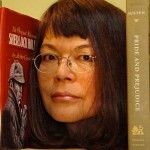 She has been a reporter and a web designer but can now be best described as an unsuccessful author. Her friends derisively call her a kept woman. She is happily married. She watched Neil Armstrong walk on the moon live.